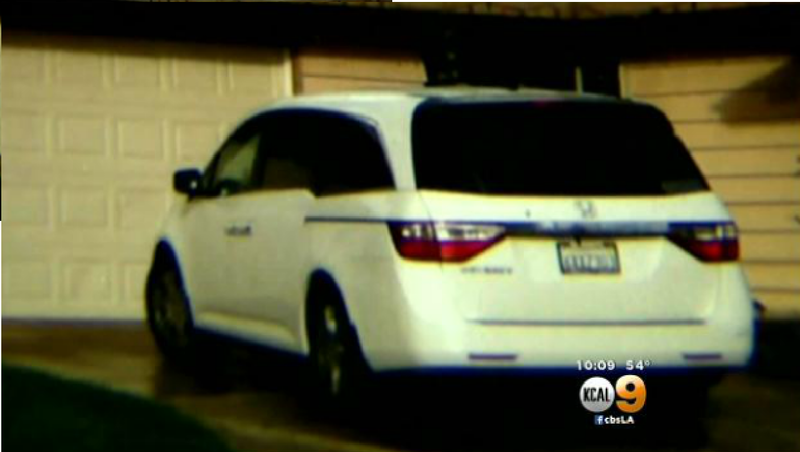 UPLAND, Calif. - Authorities say an Upland, Calif. man accused of stealing a minivan was arrested after they say he called police to report that he and the vehicle he stolen had been carjacked, reports CBS Los Angeles. Jose Cabanillas, the actual owner of the 2012 white Honda minivan, tells the station that when he and his wife woke up Thursday morning, they realized their van was gone from their driveway. Cabanillas says that when they called police to report the theft, an officer started laughing and said, "You're not going to believe this." Police told Cabanillas that another man -- identified as Cory Ball, 25, of Upland -- had just reported a carjacking involving the same van. Police say Ball had stolen the minivan from Cabanillas, then drove it from Upland to purchase marijuana in Covina, where he then called 911 after two men with a gun allegedly stole the van from him. Ball called police and reported the van stolen as if were his own and gave the same unique description as Cabanillas. "Blue sticker with yellow letters that says, 'Pioneer Junior High Honor Roll Student,' " Cabanillas told the station. The station reports investigators pieced it together and arrested Ball on the spot. Police said he has a long history of burglary and drug convictions. "Everybody is really laughing and saying, 'What is this guy thinking?' " Cabanillas said. Police are still searching for the van and the two men accused of taking it the second time. "If we didn't have insurance probably we would still be crying and thinking, 'What are we going to do?' " Cabanillas told the station.